I first met Mr. H when I visited his apartment on the top floor of an 8-story building in Sham Shui Po, Hong Kong. I had wanted to conduct a research on the lives of illegal rooftop home dwellers and was looking up as I walked along Fuk Wing Street hoping to find one. At one point, I noticed the roof of a building was covered by dense foliage. Somehow, I knew this was the one instantly. The front gate was locked and I stood outside until a resident opened the gate. I entered after him and took the elevator to the top floor of the apartment. There were 3 CCTVs outside Mr. H’s door. It was a rather formidable sight to say the least. After a few knocks, a man opened the door. He was wearing a cotton singlet and pants. Taking a deep breath, I introduced myself to him, told him the purpose of my visit and apologized for my rudeness to call on him like that. Half expecting a scolding or the door slammed in my face, Mr. H instead let out a huge laugh. He said no one ever made such a request before. What could an architect from the U.S. learn from this badly made and illegal rooftop addition to an apartment? Mr. H was a widower. He lived in the illegal home together with his son and two tenants. One was a middle age lady and the other a 90-year old man. Mr. H’s daughter lived in his apartment below. He showed me the different rooms, which he had through the years designed and constructed mostly by himself, including the installation of the electrical wirings and the plumbing system. He had resourcefully tapped the water storage cistern on the building’s roof for his water supply and connected the waste pipes of the toilets and bathroom to those of his apartment below. He also created a small fruit garden that he spent his evenings in. Mr. H was very proud of his home. He declared it would cost millions of dollars to have such a view in a high dense city like Hong Kong, not to mention the cool evening breeze during the summer evenings. While he was giving me the recently ripen grapes to eat, I was frenetically writing down everything he said. I recalled it was early afternoon when I went up the building. It was dusk when I left. I visited Mr H the next year, in January. This time, I called him in advance and brought some cakes for him and his tenants. I told him this was to make amends for my uninvited visit the year before. He laughed and said after that incident, he told all his friends he had made a new friend from America. They of course did not believe this man, who was already in his seventies and had lived all his life in Hong Kong. I asked him how he was and he said he had to deal with the building authorities recently. They wanted him to dismantle the structure and asked the tenants to leave. His retort was that he could dismantle right this minute. But what about the two tenants? Apparently, the lady was suffering from a chronic medical problem and had difficulty in finding a place to live before coming to Mr. H. He told the building inspector he was actually doing charity work, as the rent was very low compared to other places. A social worker was subsequently assigned to help the two tenants. The elderly man refused to move to a senior citizens’ home because he grew up in Sham Shui Po. He told the social worker all his friends were here, even though at his age he hardly ventured out of the building. He said he would rather die than leave the apartment. The social worker tried to find an alternative place for the lady tenant but was met with several unwilling landlords. Meanwhile, Mr H tried to appease the building inspector by removing some parts of the structure. Although winter in Hong Kong is mild compared to Chicago, the illegal home lacked solid enclosures to ward off the cold winds except for the bedrooms and bathroom. Mr. H told me this was not his biggest worry. They could always wear an extra layer of clothes to keep out the cold. The biggest problem was during the typhoon season. Except for the plastered brick walls, the rest of the place would be shaking, with the metal roof sheets vibrating and the tarpaulin sheets used as walls flapping in the wind. He had to make on the spot repairs, often amidst strong winds and driving rain to avoid more damages to the structure, even though before every typhoon season, he would secure the structure with additional materials, repaired and replaced materials that were damaged or weathered. I met Mr. H’s partner during my third visit in June. She was from China and stayed with him in Hong Kong on a social visit pass. She was hoping to secure permanent residency one day. When Mr. H was out of sight, she confided to me that due to his bad temper, his relationship with his son was strained. He was partially paralyzed after a motorcycle accident. He had not worked for quite a while and spent most of time in his room. Mr. H showed me a new addition to his bedroom, which had a hole at the bottom of the wall with a wooden door that was big enough for a person to crawl through. He said this was for him to leave the room without having to open the bedroom door. I was too surprised to ask the purpose of this door and before I could, his partner suggested we should all go out for lunch. I teased Mr. H that he could finally prove that his friend from America was not a figment of his imagination after all. Till this day, the additional small door in his bedroom remained a mystery. The restaurant was in Shek Kip Mei, a short walk from his apartment. Upon entering the restaurant, I felt as if I was transported into a different era in Hong Kong. Many elderly residents were having their lunches. Some were alone reading the newspapers. There were also groups of elderly men chatting loudly over Chinese tea. Mr. H introduced me to the restaurant owner when he came to our table. Looking at me, the owner said, “So this is your famous friend from America!” He said he knew Mr. H for a long time as he helped him to repair his refrigeration system ever since the restaurant’s early days. It was so old that none of the younger repairmen knew how to fix it when it broke down. At this point, Mr. H teased his friend and said he was such a stingy person who refused to upgrade his system. His friend replied that he took pity on Mr. H, as he would be out of work if he had gotten a new refrigeration system. The bantering between them went back and forth for several minutes. During this time, a waitress came over and handed Mr. H the menu. Before she left, she reminded Mr. H not to embarrass them by choosing the cheap dishes for lunch, especially when he had a guest from America. Although he asked me to choose whatever I fancy from the menu, I politely declined. I told him I could not read the menus and would have to rely on his recommendations. During lunch, I told Mr. H about my family, something that I had not done previously. It was also during this time that Mr. H shared with me his difficult relationship with his son. I supposed talking about my dad somehow prompted him to share his father and son story too. I would have liked to say I met Mr. H a fourth time. Sadly, he passed away in 2014. I sensed something was amiss when I tried to call him several times without any luck. I thought he might have left for China since his partner was from there. He traveled to China to see her if she could not come to Hong Kong. The dense foliage was nowhere in sight when I stared at the rooftop from Fuk Wing Street. The room next to the main door, which Mr. H used to store his equipment, was demolished. It became an empty roof terrace with junk strewn about. No one answered when I knocked on the door several times. I was getting ready to leave when I heard someone behind. I knocked again and a middle age lady opened the door. I had not seen her before. I asked for Mr. H. She looked puzzled and said the elder Mr. H had passed away. I was momentarily stunned by her answer. I told her I knew Mr. H and had interviewed him several times. We became good friends even though we had only spoken on three occasions. I asked her if I could look at the place to take some photos of its current state. Except the plastered brick walls, most the illegal additions had been removed. The staircase leading to the upper level was reduced to wooden planks with no railings. It was totally exposed and one could fall all the way down if a step was missed. But I had to go up for one last time. The corrugated metal roof was dismantled and bits and pieces of building materials were scattered around. I took some photos and walked back down while glancing briefly at the small garden I had spent an entire afternoon with Mr. H. It was now filled with broken pots and dead plants. When Mr. H passed away, it felt like the life of the structure ended with him too. The lady told me sometime late last year Mr. H became ill. He went to the clinic and came back with some medicine. He fell asleep that evening and never woke up. Just like that. A man who single handedly built this whole structure I’m standing on, cared for it all these years, struggled to keep it in existence and was so proud of his work, would just lie down and breathe his last breadth. She said Mr. H’s partner went back to China after his death and his daughter moved out from the apartment. The middle age lady tenant left soon after. Mr. H’s son and the elderly tenant were the only ones left. She was the daughter of the elderly man and came once a week to care for him and to clean his room. I walked past many of the spaces that Mr. H showed me when he was alive. I could hear his voice in my mind, explaining how he constructed the rooms and the difficulties he encountered. I passed by his bedroom with the small door. 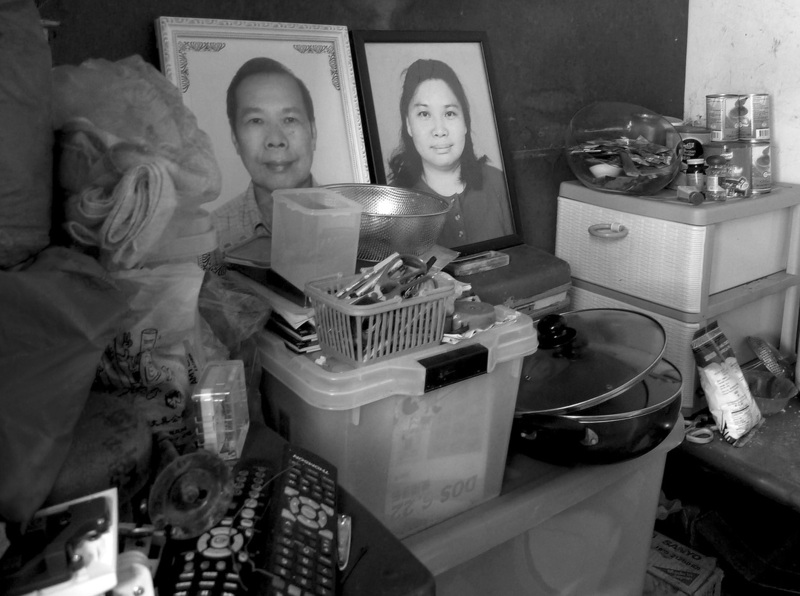 There, on top of a low cupboard, amidst an assortment of objects, cooking utensils, bags and canned food was a photo of a younger looking Mr. H. Next to him was a photo of a smiling lady. I was told she was his wife who passed away after a period of illness. I was still looking around when the lady came and said she needed to go get some groceries. I took this as a hint that it was time to go. I thanked her, stepped out and heard the door closed behind me. My research on this illegal home just ended right there and then, not with a conference presentation, an academic paper or a publication but with the death of a dear friend.